Bernard's piece is placed with adjacent works by Cornell and Tinguely because of a shared interest in collage techniques. The juxtaposition reveals how artists who use a similar method can produce works that are so varied. In the tradition of collage, Bernard incorporates materials that are seemingly unrelated and that are not usually associated with art. He refers to them as "a private inventory of object-images." The inclusion of pieces of film is, in fact, an autobiographical reference because as a student he worked in film. Bernard describes his materials as "organic cast-offs" and "disposables." 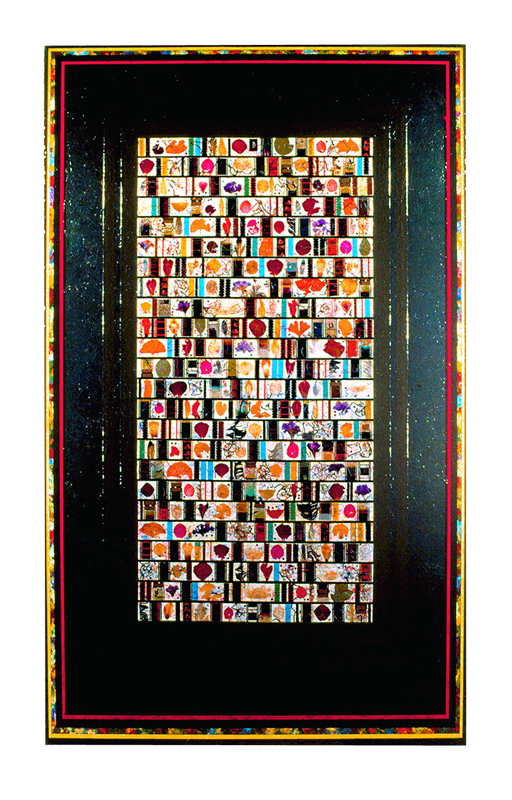 Their aestheticized, tapestry-like arrangement is a subtle commentary on the obsessive nature of collecting and preserving fragments of culture. The work's title equates the making of visual art with language. His "vocabulary" is composed of the variety of materials with which he composes and articulates his ideas.